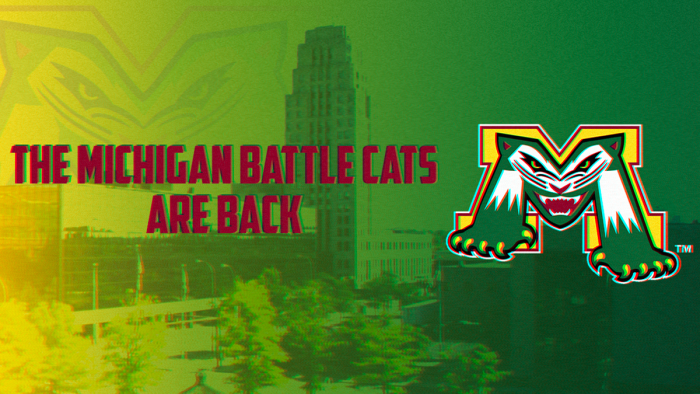 Battle Creek, MI – The Battle Creek Bombers have announced that they will rebrand as the Michigan Battle Cats. Last active in 2002, the Michigan Battle Cats were a minor league team, first affiliated with the Boston Red Sox then later by the Houston Astros. The Battle Cats will remain within the Northwoods League and give the Bombers & their mascot Mo Skeeter a big send off on Saturday July 19th. Tyler Shore, the General Manager of the new reformed Battle Cats said, ‘I’ve always wanted to bring back the Battle Cats. We only got league approval last week but there’s no time like the present so we’re rebranding effective immediately’. He also hoped fans will give the Bombers a proper send off on July 19th. ‘We’re going to host a massive party, a celebration of the fantastic 13 years the Bombers have had in this community, I hope everyone can make it down’. Throughout C.O. Brown Stadium, changes will be made to fit within the rebrand including the renaming of the Sky Loft which will be changed to ‘The Litter Box’. Fans can purchase tickets to the upcoming Battle Cats season by visiting this link. The Michigan Battle Cats are a member of the finest developmental league for elite college baseball players, the Northwoods League. The 25-year old summer collegiate league is the largest organized baseball league in the world with 22 teams, drawing significantly more fans, in a friendly ballpark experience, than any league of its kind. A valuable training ground for coaches, umpires and front office staff, over 200 former Northwoods League players have advanced to Major League Baseball, including three-time Cy Young Award winner Max Scherzer (WAS), two-time World Series Champions Ben Zobrist (CHC) and Brandon Crawford (SFG) and MLB All-Stars Chris Sale (BOS), Jordan Zimmermann (DET) and Curtis Granderson (MIA).